You take great pride in your home, with an eye for detail on décor, layout, and design. You’re no slouch when it comes to keeping it neat and tidy, but is it really clean? Your hard work is rewarded with streaky windows and mirrors, scummy shower fixtures and doors, and crusted stains along your tub, sink, toilet, and tile. From soap scum to calcium deposits, if your water is making your home a mess, you need options. There are chemical solvents that can work to dissolve the hardened minerals already there, but they will begin to reaccumulate starting with the very water you use to rinse the chemical solvent away. 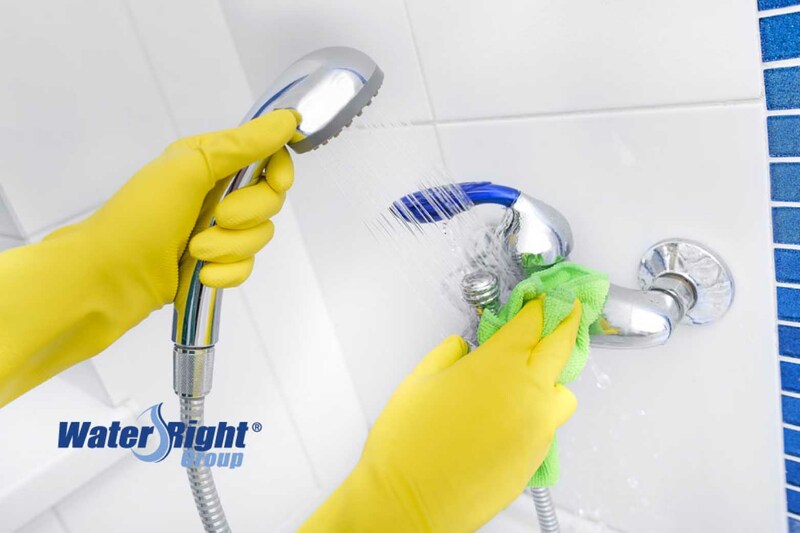 Skip the stress, lose the mess, and treat hard water with something gentle, but much stronger than elbow grease! If you have hard water, don’t be embarrassed. More than 85% of homes in the United States experience hard water. Many people think that only homes supplied by wells suffer hard water, but municipal treatment plants don’t address the mineral content of water at all. Calcium, magnesium, and other dissolved solids combine with your home’s water. When the water evaporates, mineral deposits are left behind in the form of white residue. Soaps and detergents bind to the solids, stopping them from being washed away properly. This results in slime and soap scum. Hard water isn’t just a drain on your shower walls, it can cake up your shower heads, faucets, and pipes. Not only is soap scum a slippery, unsightly mess, but it can trap mold and harmful bacteria, creating a health hazard. You might be having sudden flash backs to your last shower and remembering all the areas you noticed film or residue. You might even be thinking about shutting this page and heading to the bathroom to clean right now. Spend the next couple of minutes with us instead and you could save a whole lot of scrubbing! If you’ve ever found yourself watching infomercials on a sleepless night, you know there are innumerable products, chemicals, and solvents specifically designed to dissolve mineral deposits and soap scum residue. This alone demonstrates how common and persistent the problem of hard water is in the average American household. Lime, calcium, and rust solvents are strong and powerful treatments for existing hard water stains. Be sure to use gloves, and if you’re in an enclosed area, like a windowless bathroom, use a breathing filter or mask, and turn on the bathroom vent to move the harsh fumes out and reduce exposure. Using white vinegar or borax in your wash can reduce the effect of hard water on your laundry, and many products claim to soften water as they clean. It can be difficult to remove rust and hard water stains from clothes, but you can prevent new stains from forming! For gentler, more natural treatment of hard water, try soaking the area in white vinegar before scrubbing the area with half of a lemon. If your shower head seems hopelessly clogged, you may be tempted to replace it. Try filling a plastic sandwich bag about half way with vinegar. Completely submerge the head and attach the bag to the fixture with a rubber band. Leave it for at least 20 minutes. Remove and turn on the shower. You should notice significantly more water flow! A glance at the back of your standard toilet bowl cleaner is made mostly of chemical warnings, danger signs, and an alert to store it high out of the reach of children. Not only are these harsh solvents dangerous to touch and breathe, they aren’t as effective as you need them to be. For a safer solution, pour one cup of white vinegar into the bowl, followed by a quarter of a cup of borax. Allow the mixture to foam, and then you get to scrub the daylights out of it. It’s not a fun task, but it’s an excellent workout! And while you’re huffing and puffing over the seat, you’ll be glad you’re not huffing and puffing chemicals that could be causing permanent damage to your lungs! You installed tile for its beautiful esthetic, but now the tile is stained and the grout is grimy. Try mixing borax or baking soda with just enough white vinegar to make a paste. You might add salt to the dry mixture for its scrubbing power, but be mindful of potential etching. Apply the paste to any problem areas, including around faucets and fixtures, and wait about 20 minutes before wiping and rinsing away. It’s possible that not everyone keeps an endless supply of white vinegar on hand. No worries! Lemon juice makes a great substitute when you’re feeling the squeeze! Cleaning is inevitable, but impossible stains don’t have to be a regular part of your life. If you’re ready to skip the soap scum, ditch the dried-on detergents, cut out the crusted calcifications, take a break from temporary hard water hacks and get your water to start working for you, instead of against. A water softener easily and safely removes unwanted minerals from your water supply before they have a chance to clog, stain, and streak your home. You will use fewer chemicals and cleaning supplies, which will instantly save money and make your home a healthier place for your pets and family. If you’re ready to reclaim your weekend, get in touch with us at 402-453-5730 for a free evaluation of your home’s water quality.